Ra Ruíz Leon is a poet and dancer from Ponce, Puerto Rico. Ra began her studies in dance with traditional Boricua roots music, Bomba y Plena. Ra served as Managing Director for the flamenco dance company Xianix Barrera Flamenco. Currently she is Latin Dance Teaching Artist for various NYC dance organizations. Most recently, Ra performed in /SER/ a groundbreaking production by Angelina Ramirez for Lluvia Flamenca in Phoenix, Arizona. She was also part of Flamenco Rosado, a Flamenco project by Flamenco Vivo Carlota Santana that aimed to create a platform for LGBT Flamenco artist. She has been a featured opening act for prominent musical artists and poets such as Suheir Hammad, Eve Ensler, Maysoon Zayid, Climbing Poetree, Toshi Reagon, Meshell Ndegeocello, among others. 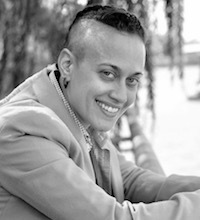 Ra has led dance residencies and poetry workshops throughout New York for organizations and venues including Dancewave, Flamenco Vivo, The Nuyorican Poets Café, Dance Theater Workshop, Wesleyan University, and The Bowery Poetry Club. In february of 2016, Ra shared the stage with NY based Flamenco artists for Ryan Rockmore’s “La Generation del 16” at Teatro Circulo. Since then she has worked alongside respected Flamenco artist such as Alfonso Cid, Sol ‘La Argentinita’, Antonia Jimenez, Mele Martinez, Angelina Ramirez, Carlos Menchaca, Jason Martinez, Olivia Rojas, and Misael Barraza Diaz. Through the creative vehicles that dance and poetry provide, Ra aims to create a platform of expression that empowers women, the LGBT community and people of color.